baby onion recipes.These are nothing but immature onions that are bite sized, approximately with 1 inch diameter, and are used in curries or barbecues and stews. They are not as strong as the other varieties of onions as they are much sweeter in taste. The reason for them being so small in size lies in the way they are planted. They are planted very close to each other and densely which does not allow them to grow more than a particular size. They are a little whitish in color and are used in various recipes all around the world. Baby onions are used a lot in Indian cuisine for their excellent flavor and cute appearance. The mild sweetness and pungent flavor comes through excellently in Pearl Pulao, which is basically rice and baby onions cooked along with rice and garnished with cheese. Another rice dish that can be made with this are Toovar Dal and Mixed Vegetable Khichdi, a one meal dish flavored with baby potatoes, coconut and many other spices. Due to their bite sized pieces, baby onions make a pleasant addition to curries and subzis as well. In the south, they use madras onions to spice up their curries but you can also use baby onions as they are small in size too. It is one of the main ingredients in Sambhar Rice and Toovar Dal. The aromatic spices, the sweet onions and the masala make these dishes come to life. 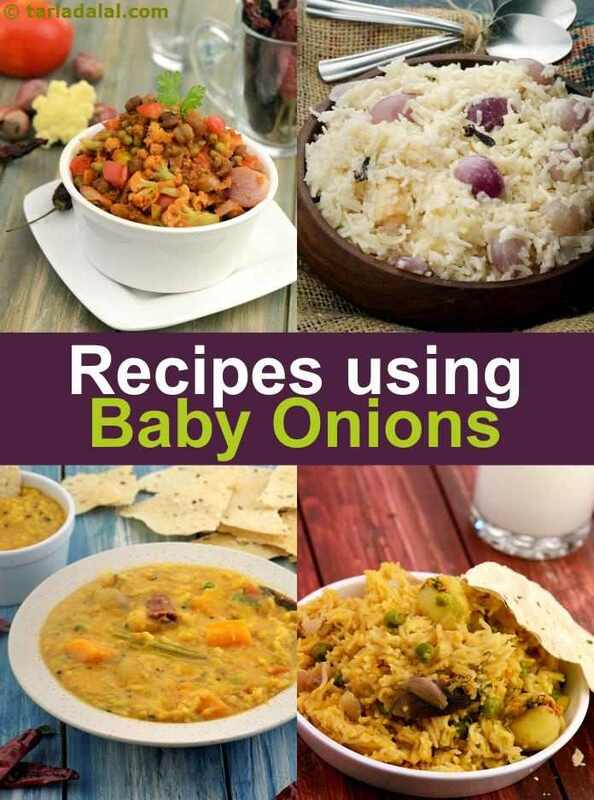 Enjoy the collection of baby onion recipes below. An aromatic onion vegetable flavoured with dry masalas. It makes an excellent side dish. A speciality of gujarat which makes a meal by itself. A must for every cocktail party. An aromatic onion vegetable recipe flavoured with dry masalas or spice powders, baby onion makes for a delicious side dish. These small, white and sweetish baby onions are easy to prepare and quite delicious. Carrot and capsicum pula (kerala style) presents a lovely combination of carrots and capsicum with aromatic rice. An appealing and mouthwatering rice recipe, pulao is delicately flavoured with choicest herbs and kerala style spice mixture. 1.when the mixture is not thick, make a paste with rice flour and add it to the boiling mixture. 2.sundaikkai vathal can be brought in south Indian grocery shops. This goes very well with rice as well as chapathi. Ek toap na dal bhaat is a gujarati specialty one pot(toap) main course recipe with rice and lentis(dalbhat) cooked together in one pot along with vegetables and spice powders. 1)the masala can be varied according to personal tastes. 4) the no of persons that can be served may vary according to appetite . Red pulav is a tempting pulav recipe. Try our rice recipe, biryani recipe, pulao recipe at tarladalal.com. Share your favorite pulav recipe online. Maidha maavu thovaran are basically maida flour dough dumplings which are steamed and then simmered in a coconut based curry. Serve the dish with rice and papads. An awesome vegetable delight recipe with a medley of choicest vegetables stir fried together with select seasonings and then served hot with chopped coriander and cream as topping. An assortment of vegetabes. rasam rice and lentils all cooked together with an array of spice powders make the delicious meal in one , a must try dish in your menu. Enjoy the meal in one recipe hot with buttermilk to complete a great meal in style. A spicy accompaniment to any meal, the Tomato chutney is made from chopped tomatoes, garlic and spice powders. Enjoy as side dish or dip with fritters, snacks or parathas.